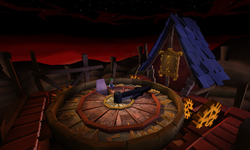 The Belfry Clock is a room in Luigi's Mansion: Dark Moon in the Old Clockworks. It where the Overset Possessor is fought. Luigi accesses this area when he attempts to go to the ladder in the Belfry. A springboard launches him as he goes to the ladder. The springboard does not launch Luigi in Outlandish Interruption, and he cannot climb the ladder, so he is not able to return here. The area has a giant clock for a floor and a giant house with big gold doors, and a cuckoo bird inside. The Overset Possessor possesses this clock during the boss fight. On every hour, a wave of ghosts or ambiance enemies pop out and attack Luigi. On a certain time, the Overset Possessor itself comes out of the clock and attempts to attack Luigi, where it can be sucked in after it tires itself out. In the former part of the boss fight, the clock hands can hurt Luigi only when they are glowing red and moving to the next hour; in the latter part, the clock hands remain glowing red and hurt Luigi when touched. Depending on the hour, sand occasionally fills the place.